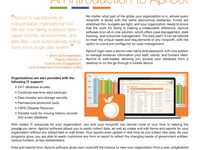 Apricot is a secure, flexible, and easy-to-use case management solution for nonprofits of any size. Our comprehensive platform includes: A secure, cloud-based case management database. Best practices modules with forms and reports for everything from donor and volunteers management to program performance and outcomes tracking. 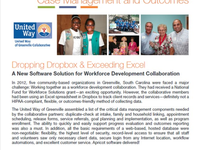 Features specifically designed for nonprofits like Referrals for tracking program movement and Workflow for streamlined data collection... And so much more! Great product and easy to customize. Pros: My favorite thing about this product is the ability to customize and build your own system. We had to move from a dead Access database but needed something affordable that we could customize. We purchased this product to manage our program outcomes but since it is so easy to customize we have expanded the use of the product to other areas. Customer service is incredible, the best I have experienced with a software company. They respond promptly and help to explain and resolve your problem. The customer service cost is included in the cost of the software so you don't have to decide how bad your problem is...you can reach out for help to minimize any disruption to your business. Finally, they are constantly upgrading their system which is free for the user. They ask for improvement ideas and often times implement them after which everyone receives the upgrade. I highly recommend their product! Cons: I really cannot think of anything I do not like about the software. Maybe that it works the best in Google Chrome and I prefer to use Firefox. The use of the software is accessible from any browser but the programmers prefer Chrome so that is where you get the best user experience. Overall: This helped us take our organization to the next level since we can now track and report data on our program. Thank you for the great feedback! We are thrilled that you are happy and are committed to continuing to exceed your expectations. It's why we love what we do! A grand design that fell short! Comments: I had heard a lot of negative experience with the Efforts to Outcomes system however they had the analytics capabilities that others didn't. In the in it was not the best option. Pros: When we were marketed the product the "bells and whistles" sounded great. They talked about a comprehensive analytics package that would allow us to not have to purchase an outside statistical package. Cons: When we began to utilize the product to the fullest extent there were a lot of S4 bugs which we were told would not be addressed immediately. As a nonprofit many orgs do not have a comprehensive Data and Evaluation Department which I felt they as a company preyed on. When we wanted to use all the capabilities the system could offer but we began to realize that Social Solutions had put less investment into these capabilities that the general use cases of ETO. 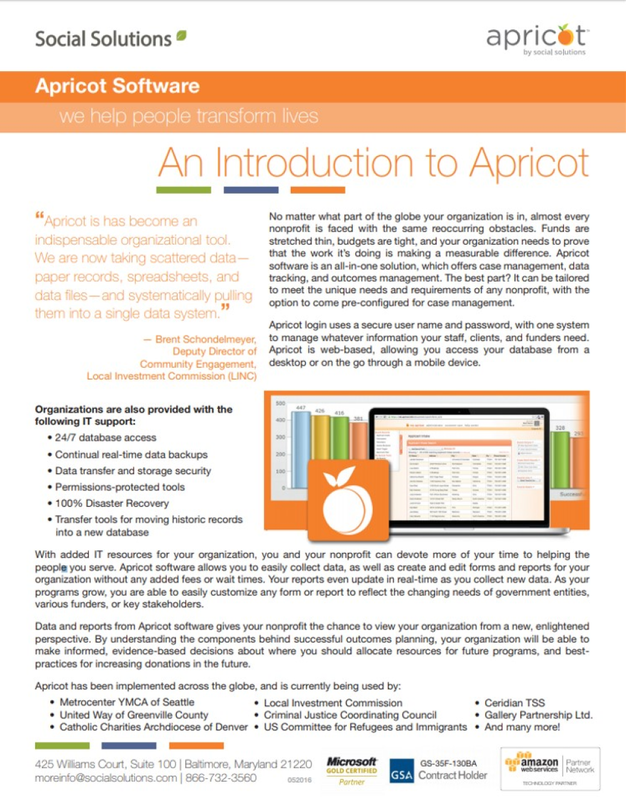 Apricot is a simplified, customized, and user-friendly software. 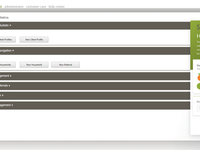 Pros: The fact that it is customized and can provide daily dashboards to easily see progress towards goals. You can also set individual access permissions. Cons: Our current setup seems to be more difficult to generate reports than what was demonstrated prior to purchase. However, the product changed hands to Social Solutions from CTK Technologies just weeks prior to us signing the contract. I'm not sure if Social Solutions has changed the functionality or if we have just not been properly trained on its functions. Overall: I'm holding out hope that we just haven't been properly trained on how to access its full functionality and that it does work as demonstrated. If this is the case, it allows those that are visual to see summary data easily in charts and graphs on their dashboard, but for data geeks like myself, we can open the full spreadsheet of data that generates the graph or pie chart. This duality makes it user-friendly to all types of users. Hi there! Since the CTK-Social Solutions acquisition, we've done a lot to revamp our resources for clients. Feel free to reach out to either me, your account manager, or the Customer Success Team for guidance on training materials and to get all your questions answered! Pros: It is a great tool for case management. It allows us to track many data points, keep updated records and next steps for participants. Cons: It would be great if it also had CRM functions. The infrastructure is there under the hood, but not easily customizable to track various donor interactions, merge with mail chimp, etc. Overall: Would definitely recommend for those in Re-Entry ministry. It has enabled us to serve our participants better. Just know that you will need another platform for CRM work. Comments: We utilize Apricot to collet data for the students, employers and partners from five states in our grant project. Over all Apricot has been very easy to roll out to staff, use day to day for staff, have student access from remote locations and build data reports. We are more limited by our thinking of the possible uses of the system, than the system itself. You do not need to be a programmer to set up data tracking forms or reports. You can easily make changes/ additions on your own. The build/ roll out process worked quickly and efficiently we were up and running in about 3 months. Online training for staff is beneficial. Customer service is quick to respond when issues are submitted. Having the capability to build graphics and bulletins on the fly is great for communicating importance/ sense of urgency with the data and goals. CTK is very open to listening and responding to requests for enhancements to the product. Trainings offered at CTK for all users is an effective way to realize additional uses for Apricot. The ability to import and export massive amounts of data allows for ease of use when sharing data in federal reporting requirements. You cannot use your own branding colors in the graphs or on the site itself- you do have to export the data to use the colors you want in charts etc. You do need Chrome/Firefox to use the system- several of our colleges have been internet explorer only users which has required instiutinal changes. I am still getting use to the software. It is hard to go in and edit the form. Comments: Overall, the software comes highly recommended and I will recommend it to other sister companies. Pros: It gives reports of all services rendered to the population we service. It a convenient was to keep track of all of the files. We can go paperless. Cons: Only the administrator is allowed to see everything beyond the page being worked on. More than one user should be allowed to see everything. Pros: Simple-to-understand form structure. They use a "Folder" concept to help you understand how the data is organized. Easy to link data from one folder to another. The form builder has a lot of simple but powerful features (like automated "Other" fields). The report engine is simple enough for most modestly tech savvy folk. And probably my favorite is the security controls...you can build security sets that inherit from other security sets. Saves a lot of time. Cons: There's a lot of whitespace that seems unnecessary. Means you might have to scroll a while. Reporting/exporting data is good, but not quite as powerful as some other products. Overall: Worked on another product for a long long time (which is also very good and powerful). Moved over to Apricot recently, and have been very pleased. It's not quite as powerful as the other product, but it's more user-friendly, and also a lot less expensive. Pros: Very thorough product with a great deal amount of functions. We have an online school and need to capture a lot of data for the students that enroll. The type of school we have demands we have constant interaction with them. This is tool has allowed us to create customized forms to enroll and track to our needs. We can also have online enrollments automatically create records we have embed into our website. Their library of information is extremely helpful and valuable. Also you can purchase an import tool to allow you to import from your present data into Apricot. Cons: It's very robust and requires learning but not as difficult as Salesforce which is why we chose this. However, be prepared to take time to learn and take advantage of live chats with customer support. Cons: When first getting this software there is a lot of setting up and creating forms which does request a lot of alternation and time commitment. Pros: Although I haven't had the chance to try out all that many products focused on non-profits exlcusively, I would have to say this one is my favorite. It is customizable and includes so many different features that it can truly be your all in one non-profit management software. Cons: The initial setup and learning process required in order to get into a good rythmn and efficiently use all features is pretty long and time consuming but worth it in the end. Comments: In using Apricot (under its previous owner CTK) for years, we couldn't have said enough wonderful things about it. It was affordable, flexible, and robust in its capability. Furthermore, customer service was top notch and had quick response rates. Unfortunately since Social Solutions has bought out CTK, it has fallen apart in several ways. First, the system has never been this unstable. We've had about a dozen service interruptions in the past 2 months (records not being searchable, secure web forms crashed, system lag and/or downtime, etc.). Although frustrating, this was digestible and perhaps the transition would work itself out. We recently learned that this isn't the only problem. As it turns out, Social Solutions has now quadrupled its pricing model and so a system that used to cost about $6000 under CTK is now well over $20,000 under Social Solutions. The system hasn't really changed and so there hasn't been a tripling in the quality of service, which in fact quality of service has gone down since the transition. On top of all of this, existing subscribers prior to the transition will be hit with a 10% increase in their contracts year over year until it reaches their current pricing model. Needless to say, Social Solutions took a wonderful product and drove it into the ground! Pros: Easy to use. The program allows you to measure outcomes easily, which is helpful to provide to donors. Cons: It took a lot of time to set up out soft ware program, specifically for our organization. There is little customer support for this process. Comments: It was just 'ok'. There are so many things they can do differently to make it a much better, smoother running product! Poor communication and overpriced for small non-profit case management. Overall: We are a small non-profit that has been using Apricot Essentials for our case management needs for the past year. Initially we were satisfied with the customizable features and ability to track and organize case notes. However, as our organization grew we realized that we had software needs that Apricot didn't fill. Not only did our the renewal specialist somehow miss our appointment to try to cancel our automated renewal due to "technical difficulties" in their system, we were unsuccessful in attempting to get in touch with her before our contract automatically renewed (WITH an automated price increase) for another year. At this point we continued to attempt to back out of our contract to no avail. We were finally able to reach someone who was very helpful but ultimately unable to assist us with backing out of our contract with a software program that does not meet our needs. Comments: We have been using Apricot for perhaps 3 months now in some form. We switched from the old CTK ODM system, and the switch has been managed extremely well. The data forms and reports were done correctly, and the technical support is responsive and of very high quality. The new Apricot system is super easy to use, very flexible to individualize, and also easy to control in terms of access. We area large state and national system, and have data that includes clinical, educational, training, fiscal, and evaluation information. We have found it very easy to not only create very simple and easy forms, but very powerful and flexible reporting options. We have even used the system to promote funding through grants and contracts, being able to give funders assurances that real-time monitoring of program data is possible. We have staff using the system with little or no formal education/training in data to highly sophisticated Ph.D. folks who use data systems all of the time. This one is our favorite, and the most powerful opportunity for us is our future use of online connectivity to powerful statistical packages. Kudos to Apricot for designing a system that is flexible, powerful, and affordable. Comments: Our organization has been working with Apricot for a little over a year, and we've had a number of significant challenges with the billing department and account management. Response times are a month or longer, many employees connect with me with inconsistent information (and weeks after I've requested), and when I ask to speak with management as my concerns have not been addressed, I get no response (I get the sense they do not deal well with complaints). Our experience has been deeply disappointing, and I would not recommend purchasing this product unless these client relations problems get fixed. Pros: Customer service is very responsive (in comparison to billing and account management). We've been happy with the responsiveness of the customer service team. Cons: The primary cons are around how billing and our account manager has interacted with us. They are not responsive - it has greatly delayed our team. Comments: Overall great program!! Worth purchasing and using. Pros: This software is an easy to understand and is a great help in order to track and input the individuals and groups you serve. It is easy to input individuals information and look up the information stored in the future. Cons: Apricot is a software we have mainly used for tracking those we served and volunteers. We have not found the software to be an easy software to use for donors or tracking of finances. 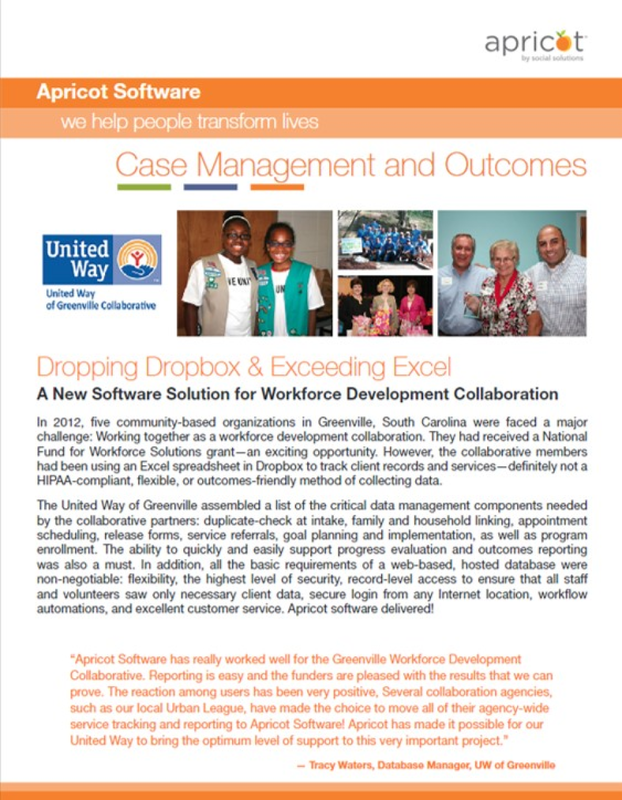 Apricot has provided a great way to keep up with case management while collecting data. Pros: I love that I can access Apricot from any computer! It is great to pull reports and gather data so quickly. Thanks for the review, Lesley! Let us know if there's ever anything we can do to help you further your mission! Comments: It has been a pleasure working with Apricot. If you are a small organization moving from Access or Excel, this is an affordable good first step. No in house techie required! Basic database knowledge is very useful for implementation but not required. Pros: The customer support. If there was an issue they would help. Cons: It was bad about not saving material and you had to put the same information in multiple times. It would freeze up a lot. There was issues with information that was sent from other software as well. Overall: I wasn't to impressed with it. Pros: I love that you essentially build every field to be accessible as a report parameter for future extraction. Cons: It can be a little overwhelming if you do not know what you want from your data on the back end. With so much customization, you can get in over your head if you are not thinking ahead. Cons: Service is non-existent unless to get your donors hard earned money. Overall: I am sure they will be in touch now - 40 days outreach through their process to get support to either cancel or postpone use of the account and nothing. Service was terrible on day one unless it was to "close the deal" so I should have known better. Now over a year later and $+ nothing has changed. Recommendations to other buyers: Don't pay a dime until you test drive the software and the service. Exception product for funding but not great for what we use it for. Pros: Not much except for the funding aspect. I like the ease of creating reports. Cons: Not knowing where we are with issues that are in development for fixing problems. Recommendations to other buyers: Know that you can not use this software easily for an unofficial EMR. But it is great for funding and donors. Pros: Easy to use and very friendly, great application and integrates well with other applications. Cons: Very expensive and doesn't upgrade constantly. It can also be slow at times. Recommendations to other buyers: Increase speed and test the different options available in the market. Pros: The best customer service in the field and above the field. Cons: None - because it is the best customer service in the field. Recommendations to other buyers: Highly recommend to everyone who is interested in good customer service. Pros: Quality products that are easy to use. Reliable also. Cons: Expensive to purchase their products considering their costs. Recommendations to other buyers: No recommendations are provided for this particular software.